A decade ago, Israelis gave little thought to the issue of illegal immigration. In 2006, there were 2,766 illegal migrants in Israel, nearly all of them from Eritrea and Sudan, who had entered Israel through its then-open, 150-mile border with Egypt. In 2007, the dam of illegal immigration burst. According to Israel’s Immigration and Population Authority, 5,179 African migrants – predominantly from Eritrea and Sudan — entered Israel from Egypt in 2007. The illegal migration reached its peak in 2011, when 17,281 arrived. When you consider that in 2011, Israel’s total population stood at 7.7 million, that means that as a portion of its total population, Israel absorbed 95 times more illegal aliens that year than Spain did. The illegal aliens settled overwhelmingly in poor neighborhoods in Tel Aviv. Violent crime in the areas skyrocketed with their arrival. Sexual offenses in neighborhoods with high percentages of African migrants were 3.5 times higher than in their rates in the general population. Violent crime was 2.5 times higher. Robberies occurred six times more often. A survey of area residents taken by the Israeli police in 2015 showed that only 38 percent felt secure outside their homes after dark. Only 43 percent felt safe in their homes after dark. Israel’s parliament, the Knesset, began passing laws to provide negative incentives to illegal aliens. One law required migrants’ employers to set aside 20 percent of their wages, which the migrants would receive only upon leaving the country. Most importantly, in 2012, Israel began building a “wall” — an impenetrable fence — along its border with Egypt. It was completed in 2013. The results were dramatic. Illegal immigration fell immediately by 98 percent. In 2013, 123 African migrants entered the country. In 2017, no one arrived. Today, among the 68,000 illegal migrants from Africa who have entered Israel in the past decade, 40,000 still remain in the country. And so last month, the Knesset passed a law enjoining the government to deport them either to their countries of origin or to willing third countries. Rwanda and Uganda reportedly signed secret agreements with Israel permitting the migrants to relocate to their countries. Open-borders champions leaked the deals to the media, hoping to force the Rwandan and Ugandan governments to cancel the deals. This month, both governments denied ever signing such agreements, although migrants are being sent to both countries. The UN High Commissioner for Refugees deems both countries safe. And, for that matter, in February 2017, the Swiss Administrative Court determined that illegal migrants from Eritrea will not be in danger if they are deported back to Eritrea. That court ruling followed a report issued a month before by the European Asylum Support Office (EASO), an EU think tank that helps Brussels determine immigration policy. EASO concluded that Eritrean asylum seekers are not eligible for asylum or refugee status because they face no danger from repatriation. Following the Knesset move, the Israeli government decided that all illegal migrants who agree to leave Israel by the end of March will be paid $3500 and receive a free one-way ticket, either to third countries which have agreed to accept them, or to their countries of origin, whichever they prefer. Those who refuse to leave Israel by the end of March will be incarcerated pending deportation, and Israel will pay them a substantially smaller amount for leaving the country. This claim — that Israel’s policy is at odds with Jewish values — was made by the Atlantic’s Emma Green in a long article criticizing the new Knesset law. Green’s article is part of a massive campaign being waged by Israel’s far left, with massive support from liberal American Jewish groups. The campaign’s purpose is to demonize the law, and coerce Israel’s government into not enforcing it. The left’s campaign against Israel bears notable similarities to the campaign being waged by leftist activists and Democratic politicians in the U.S. demanding amnesty for illegal aliens in America. Israeli opponents of amnesty for African migrants are not simply reviled as racists, however. Over the past two weeks, leftist pressure groups and activists have equated amnesty opponents to Nazis. Africans who enter Israeli illegally in search of work are equated to Jews in Europe during Holocaust desperate to escape the Nazis. The Israeli public supports deporting the illegal migrants — by a huge margin. A poll of Israeli Jews published this week by the mass circulation daily Israel Hayom found that 58 percent of Israelis support deporting the illegal migrants. Only 23 percent disagreed with the government’s policy. The rest had no opinion. But Israel’s far left has never been moved by public opinion. Backed by wealthy liberal American Jewish organizations including the Anti-Defamation League, the Hebrew Immigrant Aid Society, the Reform Movement’s Religious Action Center, J-Street, T’ruah, and the New Israel Fund, the Israeli far left responded with rage and slander to the law and the government’s decision. The New Israel Fund (NIF), a radical American Jewish group that spends millions of dollars every year in Israel funding radical leftist and Palestinian groups, has been at the forefront of the fight to force Israel to naturalize its African migrants. Currently, the NIF is underwriting at least six different groups in Israel to prevent the enforcement of Israel’s immigration laws and government decisions. 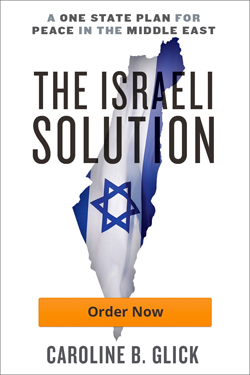 For Americans interested in finding solutions to the illegal immigration crisis in the U.S., Israel’s experience is instructive on two counts. First, border security works. The combination of legislation and the border wall ended infiltration by illegals almost instantaneously. Second, as Israel’s current situation indicates, champions of illegal immigration have no intention of making any deal. They are not fighting for illegal aliens because they want to make the world a better place. They are championing their cause because they want to make Israel a different place. And since most Israelis like Israel the way it is, there is no common ground to be found. Which brings us back to Green’s article in the Atlantic. Green noted that at the end of the day, the dispute about illegal immigration in Israel is really a fight between Israelis and liberal American Jews, who make up the majority of the pro-illegal immigrant activists in Israel. Green quoted Elliot Vaisrub Glassenberg, an American immigration activist working in Israel.